Well, the truck delivery for Philae — the Rosetta spacecraft, still doing maneuvers above — is going to do something special in February. The machine is going to scoot down real close to the comet, just before heating from the Sun could make it dangerous to do so due to gas and dust emissions. The plan is to bring Rosetta to an astounding four miles (six kilometers) above Comet 67P/Churyumov–Gerasimenko, so close that the images sent back to Earth will have a resolution of just a few inches per pixel. Scientists hope to learn more about how reflective the comet is and also to better understand how gas is emitted as 67P draws close to the Sun. “As the comet becomes more and more active, it will not be possible to get so close to the comet. So this opportunity is very unique,” stated Matt Taylor, the Rosetta project scientist from the European Space Research and Technology Center, in a NASA press release. Rosetta’s closest view of the comet previous to this was a six-mile (10 kilometer) mapping orbit that it did for a short time before moving to release the Philae lander. After that, its orbit was expected to range between 20 km and 50 km (12.4 miles and 18.6 miles) through the end of this month. Philae, meanwhile, made it down to the surface and did manage to send pictures back during its approximately 60 hours of activity, before shutting down due to a lack of sunlight hitting its solar panels. Philae is now wedged in a shady spot on the comet, but it’s possible more sunlight could fall in that area when the comet nears its closest approach to the Sun in 2015, between the orbits of Earth and Mars. A handful of pictures from Philae were released or re-released publicly last week through ESA and NASA, with far more being shown at the American Geophysical Union annual meeting (see video above, and this link that requires free registration). The European Space Agency is saying that about 20% of the mission’s science is expected to flow from Philae (at most), and 80% from Rosetta. 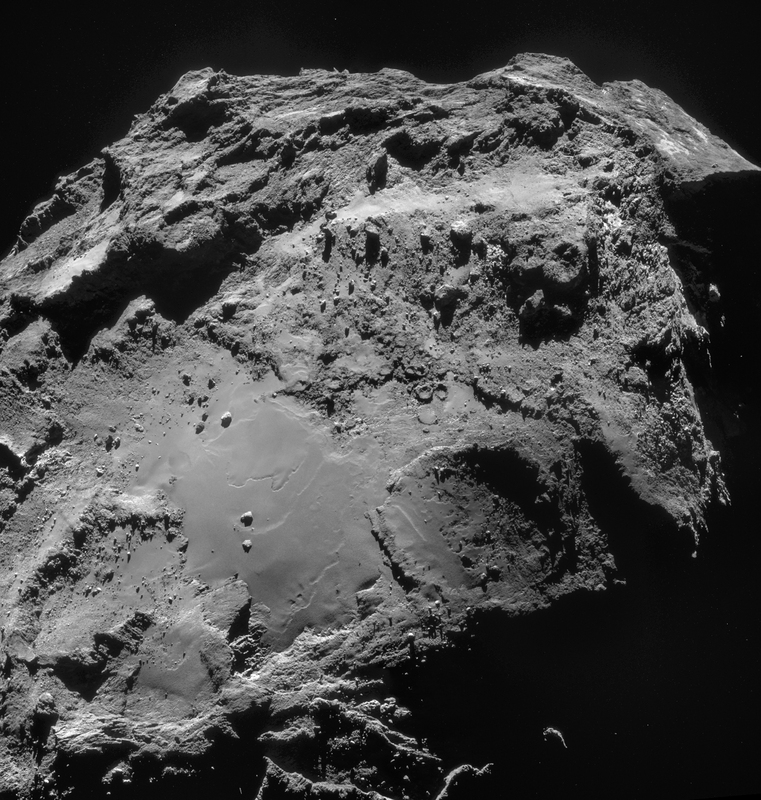 Early results from both spacecraft present some intriguing properties about the comet. Based on the ratio of isotopes (types) of hydrogen on the comet, it’s more likely that it was asteroids that delivered water to Earth. Also, Philae was unable to dig very far into the surface, implying that underneath the dust must be something like a thick layer of ice. A recent Rosetta blog post on the European Space Agency says that the team expects to take a break for the holidays from posting — unless, of course, they manage to track down the Philae lander in pictures. The location of the spacecraft is still unknown, but it’s believed that Rosetta’s high-resolution camera may be able to catch the lander or its glint — coupled with clues Philae’s experiments gave to its location. Happy well deserved holiday break to the Rosetta team. The short hiatus is more like an “Entre Acte” before the strong second half. And then who knows ? 48 years ago, “we” orbited the moon (Luna 10) and Apollo 8 less than 2 years later. Today, “we” have a spacecraft orbiting a comet way off the ecliptic plane, approaching perihelion. And lets not forget DAWN approaching Ceres. And New Horizons at the Pluto system. It looks like a well concerted plan to figure out the origin and evolution of water in the solar system. Mars and polar craters on the Moon and Mercury are being / have recently been studied for that purpose too. Now comets, asteroids and Kuiper Belt will be added to the list within a year.